For Smile Perfection, Get Porcelain Veneers in West Palm Beach! Does the condition of your teeth matter? Studies show that of the people you meet, one-third will notice your smile before anything else. That means that if you have flaws like crowding, crookedness, gaps or slight misalignments, you could make a poor first impression. Thankfully, there is a simple and effective solution with porcelain veneers in West Palm Beach. As you continue reading, you’ll learn how the process for attaining smile perfection works! Custom-crafted from high-grade ceramic material, porcelain veneers are thin shells that fit over the teeth in the smile zone. They perfectly mask any flaws and leave you with brand-new looking ivories. Numbing Medication – Your dentist will first apply a topical anesthesia to numb your mouth before the procedure starts. 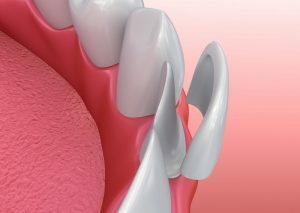 Teeth Prep – The next step is to remove a thin layer of enamel from your teeth, so that your new veneers will adhere properly. Bite Impressions – After the tooth is prepared, your dentist will then take a series of photos of your mouth and get bite impressions. This data will be sent to a trusted lab that will create your permanent veneers. While you wait, your dentist will fit you with a set of temporary shells. The Final Visit – Once your veneers are ready, your dentist in West Palm Beach will have you come back in for your final visit, where your permanent fixtures will be placed. You’ll leave your dentist’s office looking and feeling like a new person! But there are some things you should know about the process. There are a couple things to keep in mind when it comes to caring for your porcelain veneers. It’s important to remember that they can’t be whitened. Any attempt to do so will compromise your veneers and cause discoloration. It’s also good to know, though, that veneers don’t stain. However, your other teeth can still be discolored. Thus, your West Palm Beach dentist recommends that if you are considering teeth whitening, you get it done before you’re fitted with veneers. Then, when you receive your ceramic shells, you’ll have the luxury of showing a completely rejuvenated smile! To find out more about the porcelain veneers process, reach out to your dentist to schedule an appointment today! Soon, you’ll be on the road to a perfect smile! A graduate of Nova Southeastern University, where he earned his Doctor of Dental Medicine degree, Dr. Mihran Asinmaz has become a fixture in the West Palm Beach community by providing the highest quality of care to his patients. To stay abreast of the latest advancements in the dental world, he maintains memberships with several professional organizations and takes continuing education hours to further sharpen his skills. To learn more about how he can remake your smile, you can contact Dr. Asinmaz through his website.